A panel discussion with Baroness Caroline Cox, Founder and CEO of the Humanitarian Aid Relief Trust, and Mr. Iain Morley QC of 23 Essex Street and the International Criminal Tribunal for Rwanda. The event will also showcase the highly acclaimed documentary Erasing the Nuba, and a live webchat with its director, Yoletta Nyange. Genocide, or “the deliberate and systematic destruction, in whole or in part, of an ethnic, racial, religious, or national group” has taken place repeatedly throughout the 20th century. However, much debate remains around what constitutes “genocide” under international law. This ambiguity may allow for the international community to turn a blind eye, as it has done repeatedly in Rwanda, Bosnia and Darfur, to name but a few. Since South Sudan’s independence in 2011, the Islamist regime in Sudan, led by President Al-Bashir, has targeted communities that did not support the Government during the war, and has expressed its intent to make the Republic of Sudan a ‘Uniﬁed Arab Islamic State’. 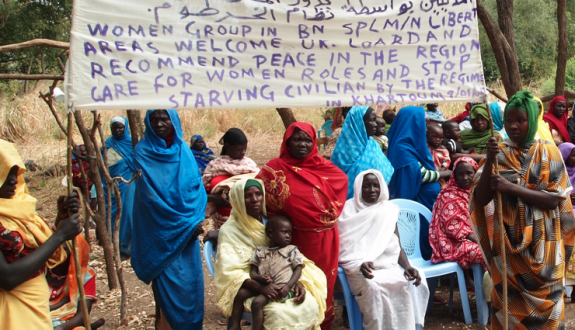 Communities in the Nuba Mountains of South Kordofan State and in Blue Nile State in particular have been subjected to sustained aerial bombing, targeting markets, schools, and gatherings of civilian people. This event will explore the current humanitarian and human rights situation in the South Kordofan and Blue Nile States, and will give a legal perspective on genocide, with reference to current events in Sudan. This is a free event, but we ask that you register in advance, by clicking here. This event is hosted by HART and René Cassin. Directions to the Bloomsbury Campus can be found here.